The RA factor test measures the rheumatoid factor blood level. The rheumatoid factor test helps screen for the presence of rheumatoid arthritis. The rheumatoid factor test measures the RA factor blood level. Why is an RA factor blood test important? The rheumatoid factor blood test screens for antibodies associated with rheumatoid arthritis. This Rheumatoid Factor Test is a blood test. The rheumatoid factor test, also known as an RF test, RA factor blood test, RF blood test and rheumatoid arthritis test, measures the RA factor blood level. Rheumatoid arthritis factor (RA factor) is a type of antibody produced by the immune system. RA factor testing is often done out of the suspicion that one has rheumatoid arthritis as elevated rheumatoid factor levels are detectable in a majority of cases. The rheumatoid factor test is tested in conjunction with the CCP blood test in the arthritis test panel. Rheumatoid factor can also be detected in other collagen vascular diseases such as scleroderma and Sjogren's syndrome which is why it is sometimes ordered with the Sjogren's syndrome test. To get an RA factor test near you, just order online and get your blood drawn at the selected Quest Diagnostics lab. 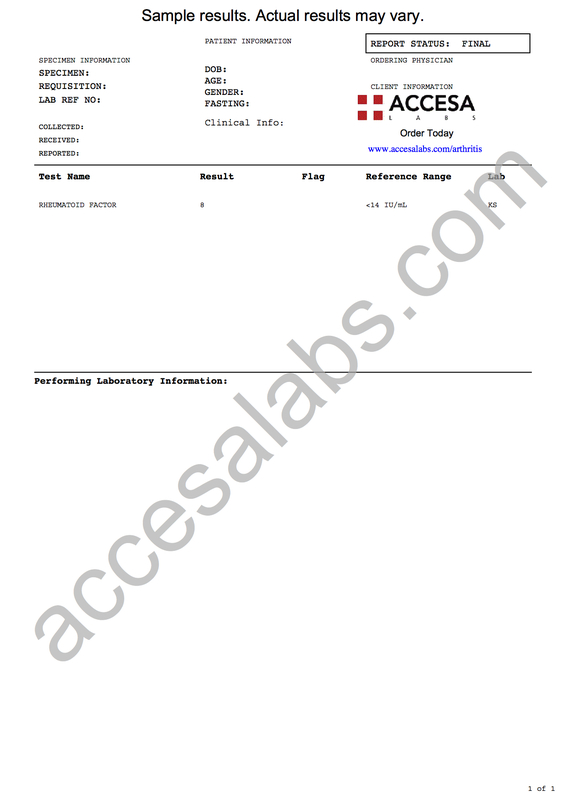 Once your rheumatoid factor lab report is ready, it will be available for download. As can be seen on the sample RA factor lab results, the rheumatoid factor blood level is reported as a number and can be compared against the reference range provided by the lab. This rheumatoid factor blood test is also tested in the joint pain test panel. Rheumatoid Factor Test at Guaranteed Prices.